ABCD rule – cite! ABCD rule (message) ABCD rule – participate! The ABCDThis glossary term has not yet been described. rule of dermoscopyThe examination of [skin lesions] with a 'dermatoscope'. This traditionally consists of a magnifier (typically x10), a non-polarised light source, a transparent plate and a liquid medium between the instrument and the skin, and allows inspection of skin lesions unobstructed by skin surface reflections. Modern dermatoscopes dispense with the use of liquid medium and instead use polarised light to cancel out skin surface reflections. was the first dermoscopy algorithmIn mathematics and computer science, an algorithm (Listeni/ˈælɡərɪðəm/ AL-gə-ri-dhəm) is a self-contained sequence of actions to be performed. Algorithms can perform calculation, data processing and automated reasoning tasks. created to helpRefers to giving assistance or support to others for mutual benefit differentiate benignis any condition that is harmless in the long run from malignant melanocyticThis glossary term has not yet been described. tumors. This algorithm, which was described by Stolz, was developed to quantitatively address the crucial question in dermoscopy of whether a melanocytic skin lesion under investigation is benign, suspicious (borderline), or malignantThis glossary term has not yet been described.. Based only on four dermatoscopic criteriameasure of how well one variable or set of variables predicts an outcome this method is relatively easy to learn and apply. The ABCD dermoscopy method has been extensively studied and it has been shown that it improves the diagnostic performance of clinicians evaluating pigmented skin lesions. It is the opinion of some that this method may be particularly well suited for clinicians with limited dermoscopy experience. The criteria that combine to create the ABCD rule of dermoscopy are asymmetry, border, colorColor (American English) or colour (Commonwealth English) is the characteristic of human visual perception described through color categories, with names such as red, yellow, purple, or blue., and differential structuresThis glossary term has not yet been described.. To utilize these criteria, a scoring system was developed to calculate the total dermoscopy score (TDS) using a linear equation. With this TDS, a grading of lesions is possible with respect to the probability that the lesions under investigation are malignant. 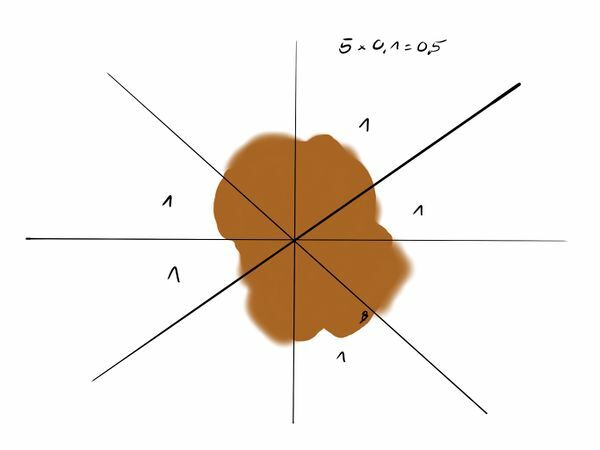 In judging asymmetry, the lesions should be bisected by two 90degree axes that are positioned in such a manner as to bisect the lesion in its most symmetric plane, thereby yielding the lowest possible asymmetry score. It is important to acknowledge that the asymmetry criterion in the ABCD rule incorporates both contour asymmetry and the asymmetry in the distribution of dermoscopic colorsThis glossary term has not yet been described. and structures. 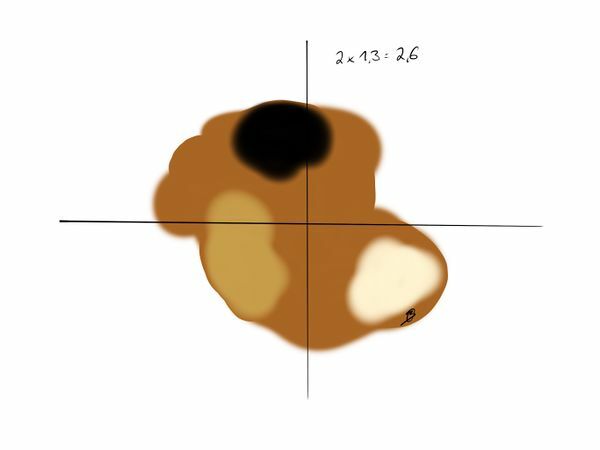 In other words, asymmetry has to be evaluated by taking into account the distribution of colors and structures on either side of each axis, as well as the contour of the lesion. If asymmetry is absent with respect to both axes within the lesion then the asymmetry score is 0. If there is asymmetry in only one axis then the asymmetry score is 1. If there is asymmetry in both axes, then the asymmetry score is 2. It is important to realize that many lesions appearing clinically symmetric may be dermoscopically quite asymmetric by revealing asymmetric distribution of colors and structures. The asymmetry score has to be multiplied with the factor 1.4. in order to calculate the total ABCD score. The evaluation of the border score is predicated upon whether there is a sharp, abrupt cutoff of pigment pattern at the periphery of the lesion or a gradual, indistinct cutoff. For the purpose of analysis, the lesions are divided into eight. The maximum border score of eight is given when the entire border (i.e., all eight segments) of the lesion reveal a sharp cutoff. If the border of the lesion in all eight quadrants has an indistinct cutoff then the minimum score of 0 is given. Minimum is 0 maximum is 8 and the factor 0,1 in order to obtain the total ABCD score. ColorColor (American English) or colour (Commonwealth English) is the characteristic of human visual perception described through color categories, with names such as red, yellow, purple, or blue. 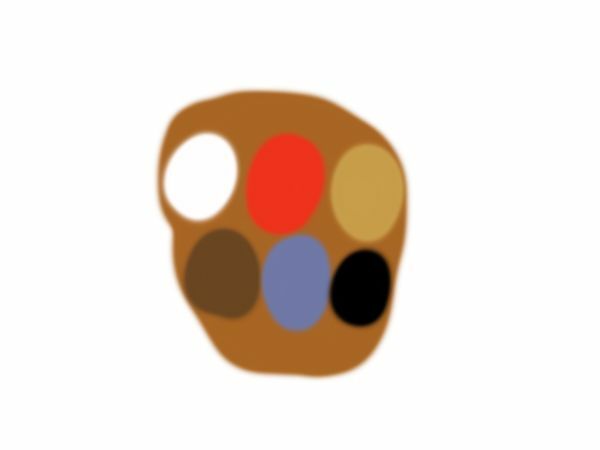 Four colors correspond with melanin distribution (i.e., light and dark brown reflect melanin localized mainly in the epidermis and/or superficialThis glossary term has not yet been described. dermis, black represents melanin in the upper granular layer or stratum corneum or all layers of the epidermis, and blue-gray corresponds with melanin in the papillary dermis). White color corresponds with areas of regression and red color reflects the degree of inflammationThis glossary term has not yet been described. 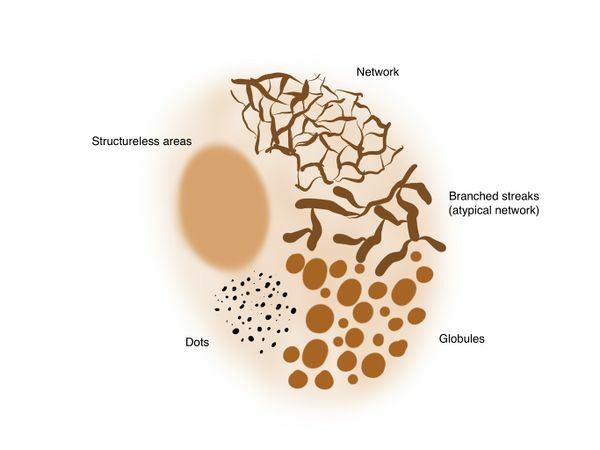 or neovascularization. The color white is considered to be present only if the area in question is lighter (whiter) in color than the adjacent color of normal skinThis glossary term has not yet been described.. The values for the color score range from 1 to 6. As was the case with asymmetry, the dermoscope reveals a wider range of colors than can be seen with the naked eye. Dermoscopic structuresThis glossary term has not yet been described. An accurate distinction between benign and malignant melanocytic lesions can be made if the individual scores of asymmetry, border, color, and dermoscopic structures (the components of the ABCD rule of dermoscopy) are multiplied by the coefficients 1.3, 0.1, 0.5, and 0.5, respectively, yielding a TDS. To calculate a formula for a TDS that would reliably discriminate between benign and malignant melanocytic lesions, 157 histologically proven cases were equally and randomly divided between a training and testThis glossary term has not yet been described. set. The reliability of the ABCD criteria and coefficients were tested on the test set of cases. At a threshold of 5.45, a diagnostic accuracyThis glossary term has not yet been described. of 94% was obtained. The diagnostic accuracy measures the number of correct diagnoses of melanomaThis glossary term has not yet been described. compared with all cases of melanoma and all cases falsely diagnosed as melanoma. In the training set, the specificityThis glossary term has not yet been described. was 90% and the sensitivityThis glossary term has not yet been described. was 100%, which indicates that all melanomas in the training set had a dermoscopy score greater than 5.45, and only approximately 10% of melanocytic nevi were falsely classified as malignant. In the test set, the diagnostic accuracy was 92%, sensitivity was 98%, and specificity was 90%, confirming the high diagnostic value of the ABCD rule of dermoscopy. In an effort to maintain the highest sensitivity for diagnosing melanoma, the ABCD rule was further refined by classifying as suspicious for malignancy all lesions whose dermoscopy score falls between 4.75 and 5.45. These suspicious lesions should be excised or monitored very closely with a low threshold for excision should any changes develop. ExceptionsThis glossary term has not yet been described. As with any rule, there can be exceptionsThis glossary term has not yet been described. to the ABCD rule of dermoscopy. MelanocyticThis glossary term has not yet been described. nevi with a lentiginous component may not be reliably classified via clinical or dermoscopic examination and these lesions often look suspicious under dermoscopy. False-positive TDS are also common when evaluating melanocytic nevi with globules or nevi with a papillomatous surface. In addition, Spitz/Reed nevusThis glossary term has not yet been described., congenital melanocytic nevusThis glossary term has not yet been described., nevus spilus, agminated nevus, recurrent melanocytic nevus, and ink spot lentigo can have a high TDS score. In these cases the typical “Gestalt” view and diagnosisis the identification of the nature and cause of a certain phenomenon. Diagnosis is used in many different disciplines with variations in the use of logic, analytics, and experience to determine "cause and effect". In systems engineering and computer science, it is typically used to determine the causes of symptoms, mitigations, and solutions is superior to the diagnosis based on the calculated TDS. Lesions located on the faceis a central body region of sense and is also very central in the expression of emotion among humans and among numerous other species., palmsThis glossary term has not yet been described., solesThis glossary term has not yet been described., and mucosa, cannot reliably be analyzed using the ABCD rule. Lesions on these locations have their own unique set of diagnostic criteria. Unfortunately, using the ABCD rule of dermoscopy does not guarantee that all melanomas will be correctly identified. In particular, it is not uncommon for amelanotic melanomas or deep nodular melanomas to have dermoscopy scores lower than 5.45. In these cases the presence of additional dermoscopic cluesEvidence, in an investigation, such as regression structuresThis glossary term has not yet been described., milky-red areas, and atypical blood vesselsare the part of the circulatory system, and microcirculation, that transports blood throughout the human bodyThis glossary term has not yet been described. can assist in their diagnosis. These criteria are also helpful in the diagnosis of early, small, or so-called featureless melanomas. In conclusion, one fact remains clear, namely, that three features are extremely important in differentiating melanoma from benign nevi. These three features are degree of symmetry/asymmetry, number of colors and number of dermoscopic structures present in the lesion. Benignis any condition that is harmless in the long run nevi tend to be symmetric, having few colors and structures. In contrast, melanomas tend to be asymmetric, having many colors and structures. This page was last modified on 17 January 2018, at 20:36.